Let's start with a FREEBIE! I am decorating my entire classroom in a Rainforest theme for this upcoming school year. I've had a farm theme for a few years, and honestly I am just tired of it. So, this summer has been spent crafting and making things for my new decor. 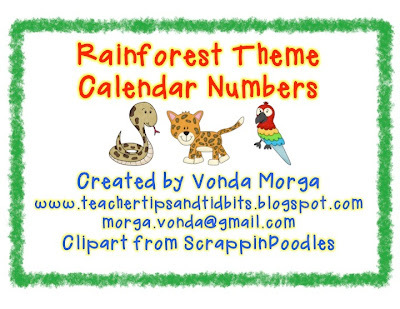 Click on the image to download your free copy of my Rainforest Calendar numbers. 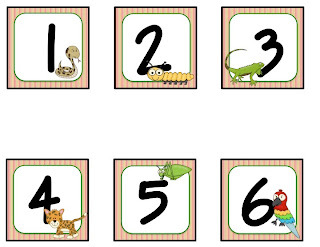 These could also be used as flashcards for number recognition or sequencing. Enjoy! Well, I am finally joining the world of blogging. I have no idea where this road will take me, but I AM READY. I look forward to connecting with teachers all around the world. I love that this medium provides us teachers with a creative and professional outlet to share thoughts and ideas. I have been teaching lower elementary since 1999, and I cannot imagine any better job. So, follow me, link with me, pin with me, enjoy TEACHING with me!